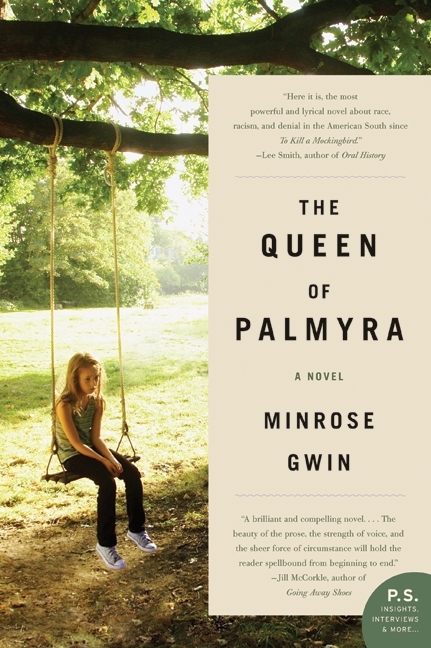 I just finished reading Queen of Palmyra by Minrose Gwin. I highly recommend this book— the writing is honest and beautiful. Plus, Minrose Gwin is a Kenan Eminent Professor of English at UNC and Co-Editor of the Southern Literary Journal. The beauty of this book is Gwin’s style of writing. She captures the innocence of Florence through her pure, naive observations. There is a soft spot in our hearts for Florence because she is the only character we meet who is untainted by the racial issues seeping in to her town. Gwin also has a way of letting the reader see the larger problems before Florence does- because, presumably, we are less naive than she is. For example, Gwin describes a box that Florence’s daddy has- a box that he keeps in the basement and brings out with him every night. As Florence describes the box from a very young perspective, our faces start to bunch up because we realize what evil Florence’s dad possesses before she even knows it. On the back of the book is written: “I need you to understand how ordinary it all was. . . .” We soon realize how important this statement is throughout the entire novel and, also, how heartbreakingly true it is. This novel is so inspiring, I was so motivated to write my own stories while reading it. Gwin tells us this story from a fresh perspective. She also teaches us that we don’t always have to pull out fancy words and the thesaurus when writing a novel. Sometimes, simplicity is the best way to let a story shine. I loved this book! I couldn’t put it down, and finished it in three days. *Book Description: To five-year-old Jack, Room is the entire world. It is where he was born and grew up; it’s where he lives with his Ma as they learn and read and eat and sleep and play. At night, his Ma shuts him safely in the wardrobe, where he is meant to be asleep when Old Nick visits. Room is home to Jack, but to Ma, it is the prison where Old Nick has held her captive for seven years. Through determination, ingenuity and fierce motherly love, Ma has created a life for Jack. But she knows it’s not enough…not for her or for him. She devises a bold escape plan, one that relies on her young son’s bravery and a lot of luck. What she does not realize is just how unprepared she is for the plan to actually work. Told entirely through the perspective of the energetic, pragmatic five-year-old Jack, Room is a celebration of resilience and the limitless bond between parent and child, a brilliantly executed novel about what it means to journey from one world to another. The perspective of this novel–young, optimistic, naive and sheltered–is what makes it so great. At first, it is hard to situate yourself in Jack’s voice because he is never grammatically correct. For instance, he says things like, “I get on Rocker to take a pin from Kit on Shelf, minus one means now there’ll be zero left of the five.” Jack refers to objects as if they are people and he tends to speak without conjunctions. After about 15 pages, however, you start to fall in love with his language so much that you miss it during the times when Donoghue falls out of this style. This is the only criticism I have about the book: Jack’s language is not always consistent–his language suddenly becomes mature during some moments in the novel and it takes the reader away from the story for a second. This only happens a few times, and is not enough to detract from the brilliance of the novel. The novel ends in a way that offers subtle closure. It both restores Jack’s innocence and simultaneously gives him a new sense of maturity. It is Jack’s isolation from the world and ultimately his discovery of the world that offers the reader a reminder of what we take for granted. Through Jack’s endearing nature, he rediscovers these things for us and makes them new again. Jack will leave a permanent mark on your memory. Okay, so this year has been pretty tough on movies. We had a long series of summer flops saved only by the box-office success of “Inception,” and the fall-winter line up didn’t look to be much more impressive. I was just about to hand in the towel and give up on 2010 as a year for movies when The Social Network came along. I’ll admit it, I was more than a little skeptical that the “Facebook” movie was already here, but from all accounts, it was supposed to be a good movie. Well, all accounts were wrong. The Social Network isn’t a good movie; it’s a great movie, and possibly one of the most culturally relevant films to come out in the past several years. The movie follows Mark Zuckerberg, the creator of Facebook, from his days at Harvard trying to get into a Final Club through the creation of Facebook, its success and ultimately his legal battles with those who helped get him there, including his best friend and co-founder, Eduardo Saverin. The movie moves quickly and keeps audiences captivated with some of the wittiest dialogue I’ve heard in years and a solid use of flashback/flashforwards as narrative devices. The acting was solid and the film boasts one of the most impressive scores ever. The boating crew race, set to a rock adaptation of “In the Hall of the Mountain King,” is quite possibly one of the best scenes I have ever seen and will make any film fan geek out with joy. The movie tracks not only the path of Zuckerberg as he becomes the youngest billionaire in the world, but also follows the growing social impact of Facebook itself. Let’s face it, it’s difficult to remember a time before Facebook came around. If you’re a senior, you were a sophomore in high school when it began, freshmen were still in middle school, and it has changed the way people, especially college students, socialize. Social Networking used to be limited to personal blogs and other sites such as MySpace; Facebook, however, took the whole game to a new level and now dominates not only the social networking scene, but the entire internet. Google recently released a list of the top 13 websites visited in 2010. Facebook was No. 1 with over 570 billion page visits, consuming more than 35 percent of all Internet use in the United States. The No. 2 website, Yahoo, received 70 billion page visits – a mere 12 percent of Facebook’s traffic. Anyone who has a Facebook account should definitely make a point to go see this movie because whether you would like to admit it or not, this movie is in part about you and how one little website created by a Harvard computer science geek changed the way you share your lives with your friends, family and the world. Also, buy the soundtrack. It’s amazing. So, unfortunately I missed the opening act, Beach House. I did get to hear them from afar as I approached the downtown Raleigh Amphitheatre. They sounded really good and I was pretty sad I only got to catch the end of them. I’d never been to this venue before, but it is surprisingly and pleasantly small. It’s right in the middle of the city, so close to the streets that a passerby could enjoy a concert if he were just strolling the streets after a nice dinner. The inside of the venue is a simple layout — most of the ground is covered with seats and in the back there is a small strip of grass that is considered the “lawn.” I had lawn tickets but I sat there for all of five minutes before my friends and I joined the mob of people that rushed toward the front. I was a fan before I went to this concert but my appreciation for this band dramatically increased after attending this concert. They sounded even better than they do on their albums. They remixed some of their songs and added in guitar solos (which was highlighted by a light shining down on Ezra Koenig, the lead singer and guitarist). They were also more alive on stage — they were louder and had even more personality (which I didn’t think was possible). Their improvisations at this concert were a true mark of their artistic ability and just one of the reasons why I gained even more appreciation for them. The light show really complimented the energy, keeping up with the beats and changing colors with each song. The light always illuminated the back of the stage, where a supersized version of their disk hung. When Ezra started playing a guitar solo, the light would cut out in the back of the stage and focus solely on him for a minute or so, mesmerizing the audience as he improvised. My friends and I also managed to head to the front and we landed the perfect seats without realizing it at first. There was a big gap between our seats and the seats in front of us — this big walkway became a sort of runway. Some people danced along it as they made their way to the designated smoking area, and for some it was the drunken walk of shame. One guy had two or five too many and he drunkenly made his way down the cement path, dancing with the audience. I was even lucky enough to get a shimmy from him. Security escorted him out, but they definitely had a fun time watching this guy. My only problem with this show was that it was way too short. Vampire Weekend only played for about an hour and ten minutes. I was wanting more from them but I guess that is kind of hard when they only have two albums. They were so electric, vibrant, colorful and energetic. It is hard to dance to their music; you don’t know whether to bob, sway your hips or jump up and down. It didn’t matter; Vampire Weekend managed to get everybody moving in their seats or on the lawn. As the band left the stage, Ezra announced that they might not be playing for a while in the U.S. I got a little emotional when he said this but I am still waiting for their next album or concert. This band still has a lot to offer us. This show was just a delicious taste of what is to come from this New York-based band. While perusing the shelves of current paperbacks at Bull’s Head Bookshop, I saw a very slim book that had a very interesting cover design. I know, I know, don’t judge a book by a cover, but it’s my MO for picking which books I’m going to read if I have no previous recommendations. Light Boxes is less than 150 pages long and easily can be finished in a matter of hours. By the end of the first chapter (which comprised of a single sentence in giant font), I was intrigued by this book. 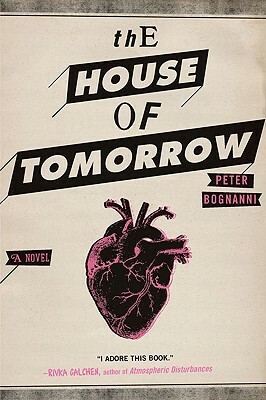 It’s a little post-modern and uses techniques such as point-of-view changes and different fonts and font sizes to tell the story, but it is still a very interesting read. The story revolves around Thaddeus and the rest of the citizens of a little town which has been experiencing the season of February for almost two-hundred days. They blame February, personified into a creator god figure, for all of their sadness and the kidnapping of many local children, and eventually plot to start a war against him. I can’t say much more without revealing the interesting plot twists (and this book certainly has a lot of them for being so short), but the revelation is one that you don’t see coming and is one of the more interesting plot twists I’ve read in a very long, long time. It’s a great read if you want something to pass the time with quickly. Put this on your summer reading list, for sure. Q: What do you get when you mix post-modern design, World War II, and Elizabethan English? A: The Department of Dramatic Arts Production of William Shakespeare’s Macbeth. Macbeth (Kahlil Gonzalez-Garcia) and Lady Macbeth (Alice Whitley) in DDA's 2010 Production of Macbeth. Photo by Stephen Ashley . e exceptions such as Baz Lurhmann’s “Romeo + Juliet,” but those are unfortunately few and far between. Back to DDA’s Macbeth. First of all, I was a little underwhelmed by their time period of choice because last spring’s production of Much Ado About Nothing was also set in the 1940’s and while it could have been considered an innovative choice then, to do it a second time is rather unimpressive. Not that World War II was a terrible fit but due to DDA’s production history, they should have branched out and done something different. 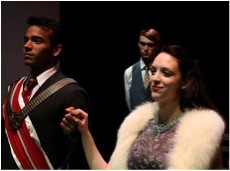 As far as production quality, for college theatre it was very good. The giant white screens that would turn red during dramatic scenes added a nice, albeit anachronistically modern, effect throughout the production and some of the director’s choices were very good – especially in the scene where Banquo’s ghost returns to haunt Macbeth. Another choice that I thought was rather interesting was to have the Weird Sisters onstage for most of the show, serving as Macbeth’s servants in his home. This played out well during the Banquo’s ghost scene when it was obvious that they were also aware of the ghost’s presence and were perhaps the cause for his appearance to the distraught Macbeth. Some of the acting seemed a little too much like acting and it was obvious that some of the actors were not comfortable in Shakespeare, but the leads were excellent. Macbeth and Lady Macbeth alternated actors from show to show, between Kahlil Gonzalez-Garcia/ Alice Whitley and Matthew Ellis Murphey and Elizabeth Philips. Gonzalez-Garcia especially was a great Macbeth and captured every nuance of the troubled king’s character. Whitley as Lady Macbeth also did a fantastic job at portraying the ruthless queen on her quest for power. Murphey and Phillips were equally as powerful in the roles and had excellent chemistry together. Overall, I would not claim this to be one of the DDA’s better productions, though it certainly was not one of the worst, either. It was fairly average in comparison to some of DDA’s past Shakespeare productions. The set design did not mesh well with the time period which did not mesh well with the plot. There was simply too much competing for attention when focus should have been given to the story. This is a very strange book. Absolutely odd. 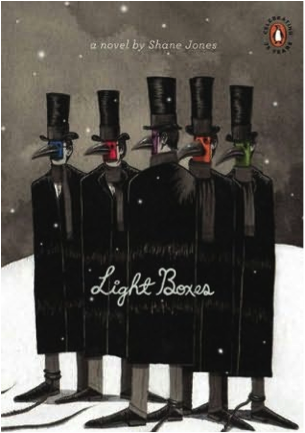 Following the story of a boy who has a makeshift heart in the form of a cuckoo clock, this story takes the reader on a very bizarre journey that is part “Moulin Rouge,” part “Phantom of the Opera” and altogether peculiar. I was unaware of the book’s background before jumping into it, which possibly made the story harder to digest, but I believe that a good book should be able to stand on its own without background knowledge required (with the obvious exception of sequels, etc.). The premise of the story revolves around Little Jack, who has been warned to never fall in love lest his cuckoo-clock heart break from the emotional strain. The day before his tenth birthday, Jack ventures out into town for the first time (up until then, he’d been kept sheltered by his doting caregiver, Dr. Madeline the witch), and sees the little singing girl and falls madly in love with her. He tries to find her but alas, she has left for Spain, never to return again. Several years pass and Little Jack decides to go after the little singer, with the only clue for her location being Andalusia. The story is full of twists and turns and outrageously unrealistic circumstances (typically, a reader can only cope with one MAJOR unrealism at a time, and “Cuckoo-Clock Heart” takes that). It’s a heartbreaking little story but more often than not, lacks true heart. It also is full to the brim with emotional baggage that is unbelievable for a ten year old to have. Now, for that background information: the author, Mathias Malzieu, is the lead singer of the French band Dionysus, and the book is a companion piece to an eponymous album they released a few years back (the original album hit shelves in France in 2007, but didn’t reach English audiences until September 2009). After listening to the album, I must say that while Malzieu is a talented singer/songwriter, he should avoid writing novelized versions of his albums. P.S. – Fans of Voltaire, Emilie Autumn, and Amanda Palmer/ Dresden Dolls will enjoy this album greatly and I do recommend it. Until next time, wear sunscreen! Some of you might recognize this title from Ryan Adams’ Jacksonville City Nights. It’s as much an ode to forlorn love and lust as anything he’s written, but that’s not what this column is about. It’s about Brown. Jackie Brown. You’ve probably seen or avoided dozens of romantic comedies. In fact, chances are you’ll probably see one this weekend. Warner Bros. and Garry Marshall, director of Pretty Woman (1990), are hoping you’ll flock to see “Valentine’s Day.” It’s an ensemble flick with famous faces like Julia Roberts, Jamie Foxx, Jennifer Garner and Topher Grace (?????) crammed into every possible square inch of celluloid. Before I continue, I should tell you that Roger Ebert tagged the film with 2 out of 4 stars. Instead of “Valentine’s Day,” I would consider another Marshall-Roberts pairing, “Runaway Bride” (1999), a critically overlooked film but one that’s well-written and provides Richard Gere with a bit more depth than he’s accustomed. Kudos to Marshall for finding a way to plug U2’s “I Still Haven’t Found What I’m Looking For” into a scene that works. Not easy. But if you’re planning on staying in on the one holiday of the year that demands that you go out, check out Quentin Tarantino’s homage to blaxploitation cinema, “Jackie Brown” (1997). “Jackie Brown” is one of the greatest love stories in film. Really. The love story between the down-and-out flight attendant, Ms. Brown, and the angst-ridden Max Cherry, a bail bondsman of 19 years, is one of honesty. Tarantino’s love poem is steeped in wisdom in which only people that have been ‘round the block can only fully understand. Cherry is in his fifties, Brown, mid-forties, but she’s told she could put a thirty-year-old to shame. Boo yah. Cherry and Brown meet outside of a jail to the sweet, sweet harmony of Bloodstone’s “Natural High,” said to be Tarantino’s favorite love song. From that point on, their relationship slowly blossoms. They share music, meet over drinks and scheme to rob a ruthless gun-runner of $500,000.